This is our news page. The latest 10 news items are displayed here. Older news items are kept on the News Archive page. A nice little video from Luke while he was testing out his new camera and video editing skills. They've also put out a new sample of Ned Feehally attempting Samson at Burbage South in the Peak District. Normally given a trad grade of E6 7a, it's more often done as a highball boulder problem these days. 8a? 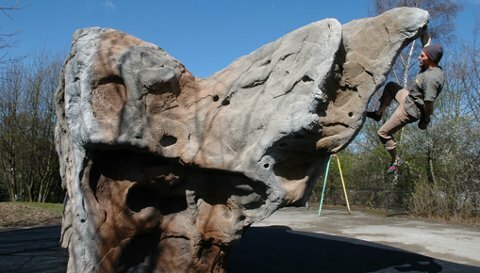 Would you be interested in a climbing boulder for Milnsbridge? Milnsbridge Enhancement Group (MEG) have had the idea of fundraising for the purchase of a climbing boulder for local people to enjoy. If you would be interested, please contact them to let them know your ideas and views. Cliff Rec is the large open area across the other side of the footpath (Wooldale Road) from the top of Holmfirth Cliff. The following information has come by way of Richard from Friends of Cliff Rec. Cliff Rec has been nominated to become a QE2 Field – an initiative developed as part of the Diamond Jubilee Year. If the nomination is approved, then the land will be protected from future development and will be there for future generations to enjoy as a recreational space. To help our case, we need public votes. This will take about 1 minute of your time by following the link below and putting Kirklees into the search. Our nomination is Cliff Recreation Ground and if you click on “Support this Field” then it’s all done. If nominated, we will then be able to bid for grants to improve the facilities available at Cliff Rec and encourage the Council to maintain its upkeep more effectively. Votes need to be cast by 18th November. At last! It's out, Tomorrow I Will Be Gone is the first full length bouldering film by Outcrop Films, watch it on here or download from Vimeo and watch at your leisure! Tomorrow I Will Be Gone from Outcrop Films on Vimeo. Another preview of the hotly anticipated Tomorrow I Will Be Gone from Outcrop Films. The full film will be out for free download at around the end of October. Tomorrow I Will Be Gone Trailer from Outcrop Films on Vimeo. Are you ready to Grin ‘N’ Bear It ? Woodhead Mountain Rescue's annual fund raising event Grin 'n' Bear It challenge takes place this year on 1st October. The 9th challenge of this type promises to be as boggy and wet as ever! The start and finish will be at Crow Edge Community Centre (SE180051) as usual, there is plenty of car parking and hot food & drinks. There is a family route of just 4.5 miles and the full blown fell race of 16 miles and walking/running routes of 16 miles and 23 miles. Entry for 2011 is now £10 advance or £12 on the day. For entry forms, route information and sponsorship forms see the Grin ‘N’ Bear It page. Showing your support would be great. Black Shadow from Outcrop Films on Vimeo. Check out the new Psyche II trailer from Posing Productions! Looks like another good climbing film.